You probably know that calcium is good for you. But in reality, youre probably murky on the details as to why its so important, and like many people, you may not be getting enough calcium in your diet. One reason may be because milk isnt your favorite beveragewhether youre lactose intolerant or you just plain dont like it. But there are lots of different ways to get the calcium you need, and you may be surprised how important it is for your health. Yes, calcium is key for the health of your bones and teeth, but it also affects your muscles, hormones, nerve function, and ability to form blood clots. Plus, research has suggestedalthough not yet confirmedthat calcium may help other problems like PMS, high blood pressure, and possibly weight gain. Calcium is the most common mineral found in the body and is required for the formation of bones and for bodily functions like muscle contractions and blood clotting. Almost all the calcium in our bodies is stored in the bones and teeth. While bones feel rock hard, theyre actually living tissue that is constantly in flux; new bone is being created while old bone is destroyed. When youre young, the process is skewed toward bone creation, and you have increasing bone density as you age, peaking at about age 30. After that, the process reaches equilibrium in adulthood. Then, as we age, the process can tip toward destruction, which can result in less dense, weaker bones. So where does calcium come in? By having an adequate intake of calcium, youre giving your body the building blocks to fuel all its important functions, as well as to knit new bone tissue. If you dont get enough calcium, the body will “steal” calcium thats stored in bones to make sure it has enough to meet the bodys needs. The recommended daily intake of calcium is 1,000 to 1,300 milligrams per day for people ages 9 and up. But guess what? Some people fall short. A recent Institute of Medicine report found that, while the majority of people do get enough calcium, girls ages 9–18 are the exception. In addition, a University of Maryland study found calcium intake to be too low for most people, particularly young women. The study found the average consumption in girls ages 9 to 18 to be about 814 milligrams daily. While women between 40 and 59 years of age increased their consumption over time, intake in children 6 to 11 years old dropped. Regulating blood pressure: A review of clinical trials in the Annals of Internal Medicine found that calcium supplementation helped lower systolic blood pressure (the first number in a blood-pressure reading) in people with and without hypertension. Another study in the American Journal of Critical Nutrition found that men in California who had high blood pressure consumed less calcium than men without hypertension. Curbing PMS: Getting enough calcium could even reduce symptoms of premenstrual syndrome. Calcium levels fluctuate during the menstrual cycleas estrogen levels increase, calcium concentrations drop, according to Susan Thys-Jacobs, MD, the clinical director of the Metabolic Bone Center at St. Lukes–Roosevelt Hospital Center in New York. Dr. Thys-Jacobs conducted a review of studies looking at calcium supplementation and PMS in women. She found that an adequate intake of calcium over time seemed to reduce PMS symptoms, including anxiety, irritability, depression, headaches, and cramps. 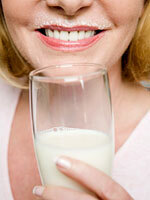 Maintaining a healthy weight: Calcium may also play a role in weight loss. In a British Journal of Nutrition study, obese women who consumed less than 600 milligrams of calcium daily went on a diet and took either a placebo or a 1,200-milligram calcium supplement daily. The women taking calcium lost 13 pounds during the program, while those taking the placebo lost about 2 pounds. As for cancer prevention, you may have heard of studies linking calcium intake with a reduction in colorectal cancer, breast cancer in premenopausal women, and a slight reduction in overall cancer risk. However, the National Cancer Institute (NCI) does not recommend the use of calcium supplements to reduce cancer risk, and it says they may even increase the risk of prostate cancer. Next Page: Should you get calcium from food or supplements? Should you get calcium from food or supplements? Calcium is found in relatively high concentrations in dairy products: One cup of skim milk has about 302 milligrams of calcium, 8 ounces of yogurt has between 250 and 400 milligrams, and 1.5 ounces of cheddar cheese has 306 milligrams. But for those who cant, or choose not to, eat dairy, there are other foods that are high in calcium, including green, leafy vegetables, fortified cereals, and soy products. Chad Deal, MD, the director of the Cleveland Clinic Center for Osteoporosis and Metabolic Bone Disease, recommends that people take calcium supplements in two doses of 500 to 600 milligrams, for a total of 1,000 to 1,200 milligrams daily. The body has difficulty absorbing more than that at one time and any excess will be excreted. Studies have shown that there is an increased risk of kidney stones in individuals who may be getting too much calcium (called hypercalcemia), but because of the way the body absorbs the mineral, this is a rare occurrence, says Dr. Deal. There are two main kinds of calcium supplements readily available on the market: citrate and carbonate. The main differences between the two, Dr. Deal says, is that carbonate offers more calcium per tablet, so consumers can take fewer pills. Also, people with low amounts of stomach acidlike patients on proton pump inhibitors for acid refluxbetter absorb citrate. Supplementing with calcium can cause nausea, gas, and constipation, but Dr. Deal says trying a different type of supplement can often rectify this. While citrate and carbonate are the most common type of calcium supplements, there are others available, including calcium phosphate, gluconate, and lactate. Can Yoga Prevent—Even Reverse—an Osteoporosis-Related Hunchback?